This morning I saw a guy back an eighteen wheeler flatbed from a busy main street into the narrow driveway of a small parking lot; men working on the windows of the building next door stopped to watch but I didn’t think it was particularly special. I waited in a short queue of cars, feeling nothing but mild irritation. Only later did it occur to me that art comes in many forms. 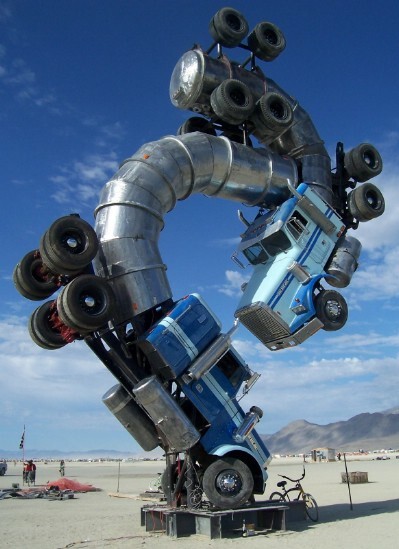 *Note: I wanted a picture of a semi for this post but because I hadn’t taken one myself, I googled “eighteen wheeler, picture” and this came up with the caption The Burning Man Project, which meant nothing to me. So I googled it and—amazingly—it happens to be an art festival. I wonder how they got this sculpture to stand? I have a friend who has been to Burning Man a number of times. She sent me some pictures and some of the creations (like the one on your blog) are truly amazing. It all takes place in the desert where people camp out and just commune. It is a celebration of anarchy and art. I think you would have to be prepared to really rough it as it can get quite cold, but it sounds amazing. Well that’s amazing… that you’ve even heard of this event, much less know someone who’s been. What a kooky, tiny world it really is. Re: difficult driving maneuvers. When Thelma and I got married we hired a stretch limo to drive us and friends from our home to Charlottetown (a 90 minute drive). When it came time to return it was late at night and we have a long lane to maneuver down. The limo was so long there would not have been enough room for him to turn around to leave, so he backed up the entire way along our lane in the pitch darkness. It was quite a feat and an entertaining way to cap off the evening. This lane of yours is infamous! You and Peter must come see it.